More than half the cats Cats Protection help are cared for thanks to legacy gifts, as over half our funding as a charity comes from incredibly kind and generous individuals remembering Cats Protection in their will. Without the support of these cat lovers, we simply wouldn’t be the charity we are today. Remembering Cambridge branch of Cats Protection in your will, no matter how large or small your gift, makes a huge difference to how many needy cats we can help. As an example, in 2018 we received a substantial legacy from a very loyal supporter which allowed us to purchase 3 new outdoor pens. See picture for one of the foster cats enjoying their temporary accommodation until we can find them a forever home. 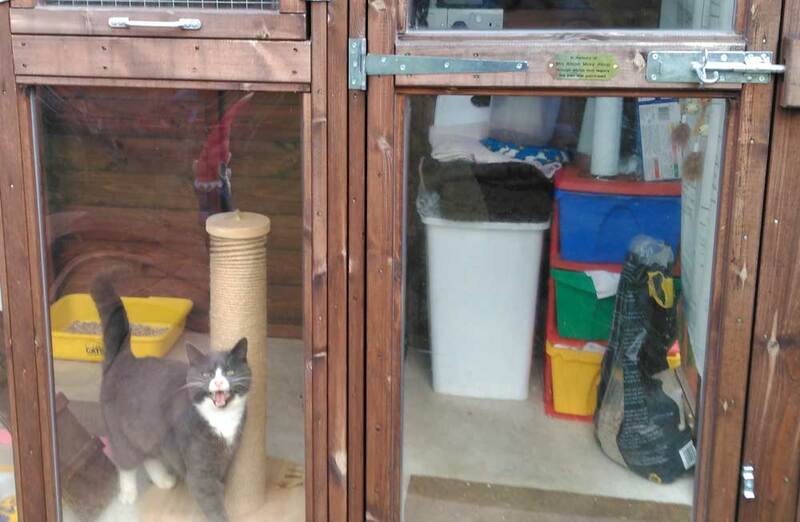 This is just one example of how remembering Cambridge branch of Cats Protection in your will, however small the donation, can make a real difference to our work. To find out the lasting impact a gift in your will could make to the lives of cats and kittens in Cambridge, please contact our Coordinator or Treasurer by calling 01223 356999 to have a chat or request to receive some information by post. Worried about your cat? Cats Protection understands that many of our supporters are concerned about what might happen to their cat, in the event of their death. For many years, CP have provided comfort to individuals worried about this situation, by offering to make arrangements to care for their cats should they die. Visit http://www.cats.org.uk/get-involved/support-us/legacy/how-gift-will-menu/cat-guardians for more information. Have you FOUND a cat?